Annascaul Hills – Annascaul Walks! 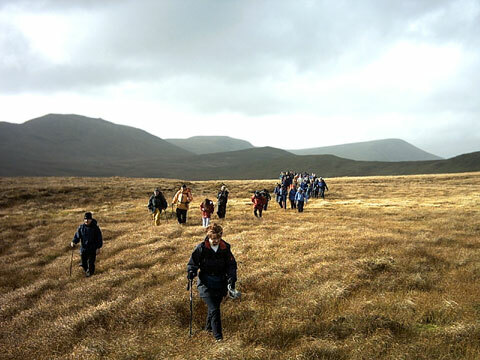 Annascaul provides a wonderful location for walkers to enjoy the unique attractions of West Kerry. Annascaul provides easy access to the Slieve Mish mountain range that forms the dramatic backbone to the Dingle Peninsula. As well as a number of local way marked routes, the Dingle Way passes through Annascaul and Inch. Mount Brandon, the second highest peak in Ireland is little more than a stones throw from the village. Walking in the area provides for a rich mixture of views. From the rise above Annascaul Lake you can see the full vista of Dingle Bay across to the Blasket Isands, back over to Brandon Bay and Mount Brandon and along the rich valley of Annascaul to Minard Castle and Bunaneer. From the same vantage point, which is one of many, you can see the rich pre-and early-Christian archeological history to be found in the land and landscape of Annascaul and Inch. The area has one of the richest concentrations of ring forts (lios) and standing stones (gallán) in Europe. Nearby is Inch Strand (Trá na Ins), which, as well as being a location for the filming of Ryan’s Daughter, is a European protected habitat. Annascaul is the birth place of the famous Antarctic explorer Tom Crean. Internationally renowned sculptor Jerome Connor was also born in Annascaul.